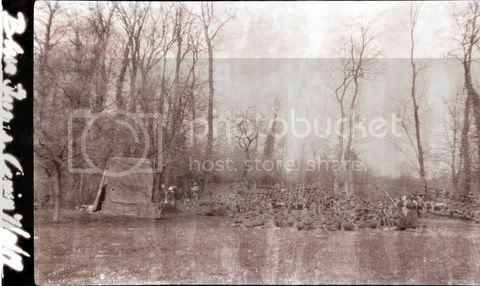 This photo of a Blue Gums concert was taken at the village of Cerisy (Picardy) on 7th April 1919, not at the concert referred to by Jack in the diary entry for 3rd September 1918. 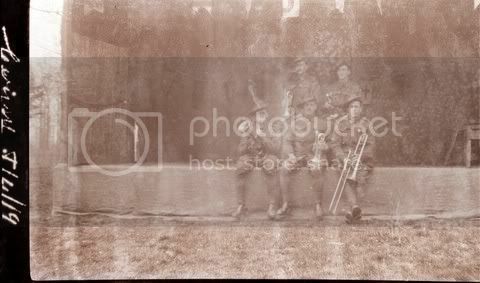 This is a scan of another rather aged negative that shows some of the 43rd Battalion band lads on the Blue Gums stage. The only person I can (almost) positively identify is the corner player seated centre - Sergeant Percival George ALSON. This photograph appears to be of another Blue Gums concert, of an evening, with nurses also in the audience. We both here always look at these sorts of photographs seeking the person 'out of time' that often seem to reside in them. Such people have a certain look to them that sets them apart from the others in such images. 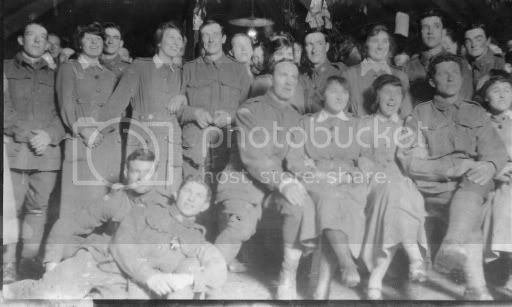 This time it's the fellow in the B&W photograph, back row, LHS, just behind and to the right of the nurse. He has a look like he might just as well have been from some other era maybe having travelled thru ntme to be there just for the taking of the photo. You can be assured that they are all 87 years and 5 months older, anyway, Tapper.